Kim Jong Un has become the first North Korean leader to set foot in the South since the 1950-53 Korean War. Smiling and holding hands, North Korean leader Kim Jong Un and South Korean President Moon Jae-in met at the heavily fortified demilitarised zone between the countries on Friday in the first summit for the two Koreas in over a decade. The dramatic meeting, aimed at ending their decades-long conflict, comes weeks before Kim is due to meet U.S. President Donald Trump. "We are at a starting line today, where a new history of peace, prosperity and inter-Korean relations is being written," Kim said before the two Korean leaders and their top aides began talks. Moon and Kim are expected to discuss denuclearisation and exchanges between the Koreas and also will plant a memorial tree at the border truce village of Panmunjom. Just days before the summit, Kim said North Korea would suspend nuclear and long-range missile tests and dismantle its only known nuclear test site. But there is widespread scepticism about whether Kim is ready to abandon the hard-earned nuclear arsenal his country has defended and developed for decades as what it says is a necessary deterrent against U.S. invasion. 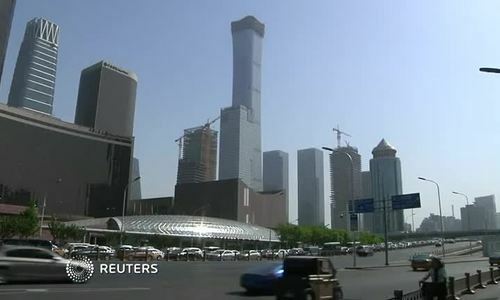 Two earlier summits between the leaders of North and South Korea, in Pyongyang in 2000 and 2007, failed to halt the North's weapons programmes or improve relations in a lasting way. "Today, rather than create results we won't be able to carry out like in the past, we should make good results by talking frankly about current issues, issues of interest," Kim said. 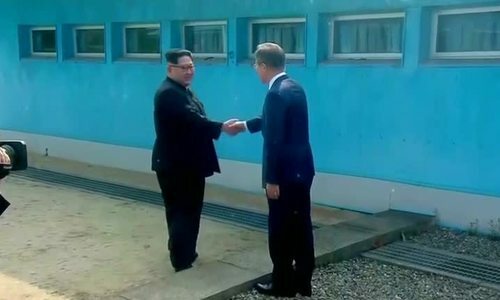 Moon greeted Kim at the military demarcation line, making Kim the first North Korean leader to set foot in the South since the 1950-53 Korean War. The two were handed flowers by a South Korean children, residents of a village situated in the demilitarised zone. The pair were met on a red carpet by a South Korean honour guard in historical costumes and playing traditional music. "I hope we will be able to talk frankly and come to an agreement to give a big present for the Koreans and the people around the world who wish for peace," Moon said as the two began their official talks. Minutes before Kim entered Peace House, a North Korean security team conducted a sweep for explosives and listening devices, and sprayed apparent disinfectant in the air, on the chairs, and on the guest book. The United States is hopeful talks between Kim and Moon will make progress on achieving peace and prosperity, the White House said in a statement as the two men began their summit. Earlier Friday, North Korea's official KCNA news agency said Kim would "open-heartedly discuss with Moon Jae-in all the issues arising in improving inter-Korean relations and achieving peace, prosperity and reunification of the Korean peninsula." Moon travelled to the meeting in a large motorcade, stopping briefly to greet dozens of summit supporters waving South Korean flags near the presidental Blue House in Seoul. The White House released two photographs of then Secretary of State-designate and CIA chief Mike Pompeo's meeting with Kim in North Korea over the Easter weekend to discuss the planned summit. It was Kim's first known meeting with a U.S. official. The photos show Kim and Pompeo, who was confirmed as secretary of state on Thursday, shaking hands. In one they faced each other looking serious; in the other they both appeared to wear faint smiles. 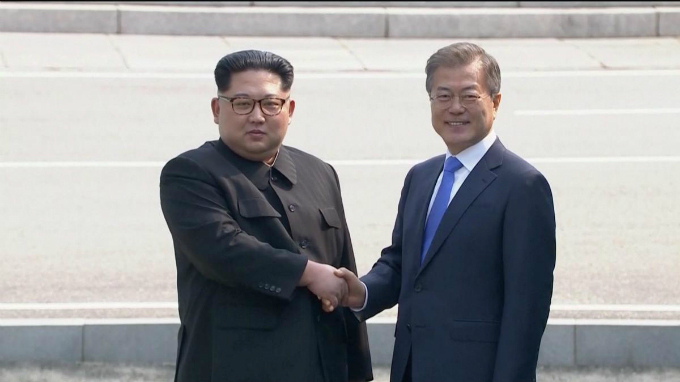 For the first time, key moments such as Kim crossing the border into the South, the two leaders shaking hands and walking to the Peace House for their talks, were broadcast live.